What are THEY planning for us ?? Comments about your favorite candidate, the newest PROPOSED law, and the FEMA camp near your hometown should go here. Re: What are THEY planning for us ??
" BFM TV spreads false information about the movement, alleging that the channel purposefully underplays the size of its demonstrations. " Whilst BFM TV were reporting " only dozens " - Agence France Presse (AFP) was reporting that “several hundred” Yellow Vests gathered outside the headquarters and Police used tear gas grenades on the crowd after the protesters lobbed projectiles in their direction. In 2004 Macron graduated from the National School of Administration (ENA) and joined the upper civil service. Then, in 2008, he paid €50,000 to buy himself out of his government contract and became an investment banker with Rothschild, where he was highly regarded and quickly made a small fortune. The families that have ruled the West for hundreds of years and sought to extend their influence across the world in a number of ways, including military imperialism, have now come to the end of their dominion and are desperately trying to hang on to their control. One way they may seek to do this is by starting a third world war, just as they engineered the last two. Their time is running out however and their piggy bank, the global monetary and banking system, which has funded their efforts for three hundred years, is on the brink of falling apart. Without this source of power they will be naked and brought to justice for their many crimes. I don´t know about the US, but in Europe the Yellow vests DO get media attention. The yellow vest protests aren´t limited to France, where they started, but spread out over other countries too. From what I´ve read/heard they don´t have a clue what they´re protesting against/for. 2) In his first 3 months as president, Emmanuel Macron spent €26,000 on makeup, paid for by the French taxpayer. His predecesor François Hollande reportedly spent even more on makeup. The Pentagon’s own numbers show that it can’t account for $21 trillion. Yes, I mean trillion with a “T." Given that the entire Army budget in fiscal year 2015 was $120 billion, unsupported adjustments were 54 times the level of spending authorized by Congress. That’s right. The expenses with no explanation were 54 times the actual budget allotted by Congress. Say it slowly to yourself. At the end of the day, there are no justifiable explanations for this amount of unaccounted-for, unconstitutional spending. Right now, the Pentagon is being audited for the first time ever, and it’s taking 2,400 auditors to do it. I’m not holding my breath that they’ll actually be allowed to get to the bottom of this. But if the American people truly understood this number, it would change both the country and the world. It means that the dollar is sprinting down a path toward worthless. If the Pentagon is hiding spending that dwarfs the amount of tax dollars coming in to the federal government, then it’s clear the privately held Central Bank is printing however much it wants and thinking there are no consequences. Once these trillions are considered, our fiat currency has even less meaning than it already does, and it’s only a matter of time before inflation runs wild. It also means that any time our government says it “doesn’t have money” for a project, it’s laughable as the Privately held Central Bank can clearly “create” as much as it wants for bombing and death. So why can’t our government also “create” endless money for health care, education, the homeless, veterans benefits and the elderly ? The Office of the Inspector General (OIG) issued a report “Army General Fund Adjustments Not Adequately Documented or Supported”. The report indicates that for fiscal year 2015 alone the Army failed to provide adequate support for $6.5 trillion in "journal voucher" adjustments. According to the GAO's Comptroller General, "Journal vouchers are summary-level accounting adjustments made when balances between systems cannot be reconciled. Often these journal vouchers are unsupported, meaning they lack supporting documentation to justify the adjustment or are not tied to specific accounting transactions…. For an auditor, journal vouchers are a red flag for transactions not being captured, reported, or summarized correctly." (Note, after Mark Skidmore began inquiring about OIG-reported unsubstantiated adjustments, the OIG's webpage, which documented, albeit in a highly incomplete manner, these unsupported "accounting adjustments," was mysteriously taken down. Olivier Beziade, a father-of-three, is in a medically-induced coma after a plainclothes officer shot a flash ball through his head during Yellow Vest protests in Bordeaux on Saturday. A uniformed officer also threw a stun grenade in Beziade´s direction. Beziade suffered a “very serious brain injury” that may be permanent. Beziade’s wife, who was with him when he was shot , said they shot at them “like rabbits”. 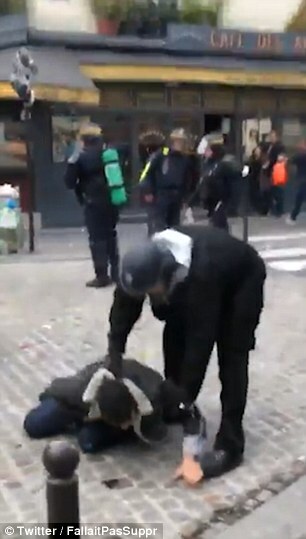 The cops claim that a gang of Yellow Vests was “trying to get into an Apple store nearby” and promised a “full investigation”. This shouldn’t be surprising as Emmanuel Macron has ordered the armed police to attack the protesters with increasing brutality. Alexandre Benalla, the disgraced former bodyguard of French President Emmanuel Macron, has been placed in custody during a probe on using diplomatic passports after resigning from the Élysée Palace. Macron's chief of staff, Patrick Strzoda, told the Senate Law Commission on Wednesday that Alexandre Benalla used the diplomatic passports 20 times between 1 August and 31 December 2018. Strzoda also said Benalla had used a fake document with the letterhead of the President's chief of staff to request his second service passport. Benalla said on 30 December that he had returned his diplomatic passports to the Elysée Palace in August but they were given back to him at the beginning of October by "a member of the presidency". Since they were given back to me, I did not see any reason not to use them. I may have been wrong to use these passports. But I did it only for personal comfort, to make it easier for me to travel in airports. I did not use them for my business, and I do not see what they could have done for me. They cannot deny it. It will be very hard to do because all these exchanges are on my mobile phone. Claudio Borghi is a member of the Lega and chairman of the Budget Committee of Montecitorio and is calling for immediate legislative action to remedy the "anomaly of gold held and managed - but not owned by the Bank of Italy". Italy’s Deputy Prime Minister Matteo Salvini and his coalition partner, Luigi Di Maio, called for replacing the current administration of the Bank of Italy, which controls Italy's gold and foreign currency reserves. The government accused the regulator's current management of failing to maintain proper supervision of the country’s banking system. The Bank of Italy enjoys a broad autonomy with its decision-making process absolutely independent from the Italian government. Past efforts by Italian authorities to gain control over the country’s gold reserves were halted by Brussels as disruptive for Bank of Italy’s independence and public financing rules. Step three - they refused so now what ? MPs will today vote or whether they want to leave the European Union without a deal after Theresa May suffered another humiliating defeat on her Brexit plans in the Commons. They voted by 391 to 242 against her deal on Tuesday, just 17 days before the UK is due to leave the bloc. A vote is now scheduled for Wednesday on whether the UK should leave without a deal or to ask the EU to postpone Britain's departure. David Cameron ( cousin of the Queen and the " architect " of this mess ) says no-deal would be a "disaster" and he wants to see it ruled out. What happened last night is some people who've always wanted Brexit have voted against it again and this is exasperating for the Prime Minister. And I think she should feel free to look at other alternatives for partnership deals and the like in order to solve this problem because you can't go on with a situation with people who want Brexit keep voting against it. Former PM David Cameron has warned MPs failing to rule out a no-deal Brexit would be a "disaster" for Britain. He said he backs Theresa May's attempts to secure a deal. I've always supported the Prime Minister in her attempts to have a close partnership deal with Europe and she continues to have my support. That's the right thing to do. Obviously what needs to happen next is to rule out no deal, that would be a disaster for our country, and to seek an extension and I'm sure that's what's going to happen next. Brexit negotiator Guy Verhofstadt says he sees no reason to given an Article 50 extension unless Britain clarifies what it wants one for. I don't see any reason to give any extension if first of all we don't know the majority position of the House of Commons. Why we should start to give even a short extension if there's no clear position of the House of Commons. It led the Prime Minister to consult Dayan Ehrentreu , former Head of the London Beth Din , the Rabbinical Court , about his roots in a meeting he called " one of the highlights of my year "
“How much easier for the powers-that-be to turn the problem around, and declare that, unless you make a hue and cry, your organs belong to the State”. Glover said that under the new English system, which he branded “presumptuous”, trust could be eroded with doctors feeling under pressure to remove organs swiftly around the time of death. It has also raised questions of the moral implications, and issues of personal autonomy, if the state can presume rights over a person’s organs after death. The other law would declare the Italian people to be the owners of the Bank of Italy’s reserve of 2451.8 metric tons of gold, worth around $102 billion at current prices.